Cuba is 740 miles long and Havana is on the Northwest part of the island. We drove SW from Habana. 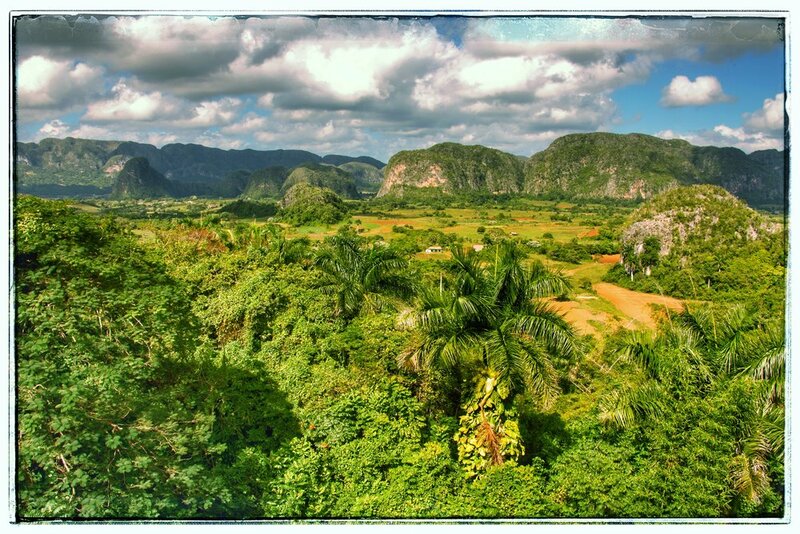 After 3 days in Havana, we climbed into a 1954 Olds and drove over 2 hours to Vinales, a tourist resort of 27,000 residents and 3,000 tourists near the Parque Nacional de Vinales (National Park). The National Park is gorgeous. Lots of residents travel like this. Carts were everywhere. The citizens of VInales are much wealthier than most due to heavy tourism. Building on top to create more rooms for the tourists. Many ride horses here for their transportation. This painting was commissioned by Fidel over 10 years ago. The drying barns for the tobacco leaves.in the National Park, where no machinery can be used. 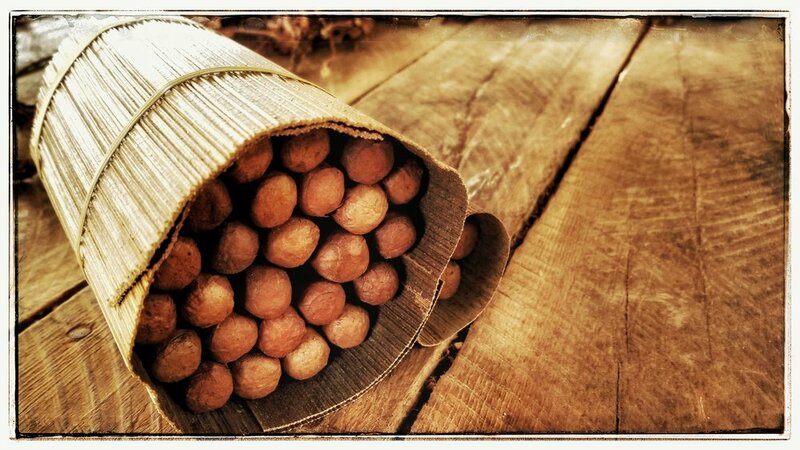 We explored two tobacco farms and saw how the entire process of making a cigar (dipping the end in honey or rum) worked. I smoked my first (and last) cigar. Seemed smooth to me. For the second tobacco farm, we rode on horses (I rode “Palamo”) for about 90 minutes into the Vinales National park. On the farm, no industrial machinery can be used, even the sugar cane press and coffee grinder was by hand. The tobacco leaves are dried in barns with palm leaves as siding. On the farm we visited, it is run by 2 brothers, one of which has 5 kids working the farm. The elders are plowing the fields with farm animals and the younger ones are giving the presentations. Here is their 72 year old uncle with his ox. All tobacco farms are monitored by the government, requiring 4,500 plants per acre. They even send government inspectors to count the plants. Ready for harvest, government employs women to separate the plants (top of the plant are the best for Cubanos, Middle is Monte Christos and bottom leaves Romeo and Juliet’s. Farmers are not allowed to put any labels on their cigars, but wrap them in banana leaves. They take 90% leaving the farmer to sell the remaining 10%. They do keep their beans and coffee plant products from the small left over land they are allowed to manage. Imagine government controlling all production...that is Cuba. The "official" government cigars have added tar and nicotine and marketed up an incredible amount to sell to tourists. Going to the farms directly, they can sell you cigars at $4 (vs. $14), but won't have a band, but neither will it be laden with tar and nicotine. The farmers sell honey, coffee beans (both in plastic water bottles) and rum that they make with the land not regulated by the government. We also went on a boat to go thru some underground caves. 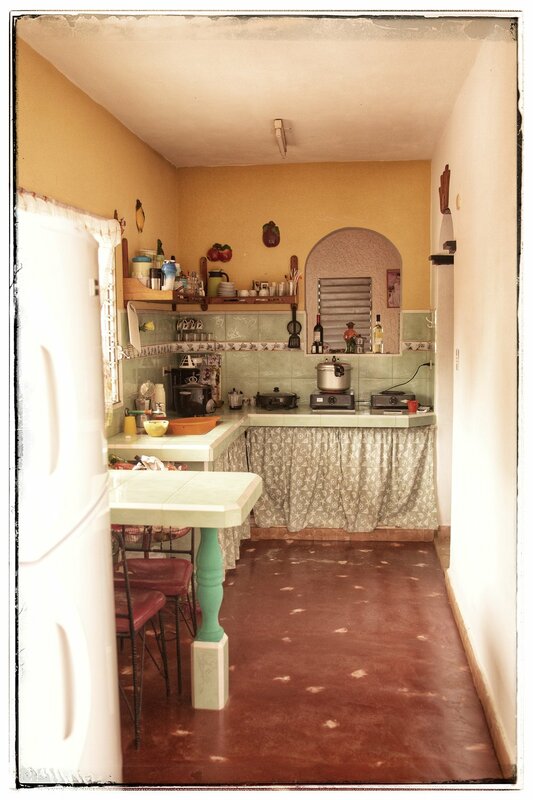 There in Vinales, 3 neighbors housed us (each having 1-2 private rooms with a bathroom in their casa). My hosts, Marcelo 71 his wife Marta 63 and behind them lived his son Yusmiel (36, a former electrician that now drives a taxi because he makes more Pesos) and his wife Lida and their 9 year old son Victor and 4 year old daughter Yennifer. Yusmiel and Lida's home is behind his parents and has 2 rooms they rent out. The family in front of the parents home with the great grandfathers’ 48 Olds. The blue outfits was my idea. Their little puppy, Toby. He was so sweet and friendly (just like the people in Cuba). We met tourists from Finland, Sweden, Norway, France, Germany, Czech Republic, Poland, Mexico, Canada, and even some from Atlanta, but American tourists are sparse. Going back to Havana, at the gas station, we encountered this Russian fuel tanker. The last 2 nights back in Havana, we went to the local baseball game where the Havana Industrials beat the league leaders, La Tunas. Never have I heard so much clapping, horn blowing, and prerecorded music playing. It was a wild and loud zoo. 85% of the attendees seem to be men in their 20's and 30's. Cost was 5 cents to get in because our Cuban friends bought our tickets. 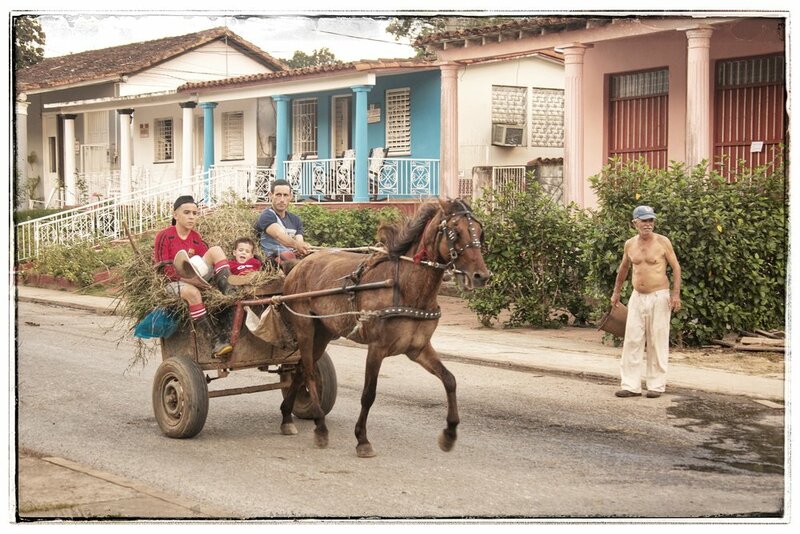 Some advantages Cuba has is they are super family oriented, spending much of their time being with their friends, neighbors and family and not being absorbed by entertainment (and with the internet hard to access, not distracted by digital devices). Racism on the street level (I can't speak for positions of power) is nonexistent. They say there is no Black Cubans or White Cubans, just Cubans. I wish we could do the same here. The children can’t buy crayons in Cuba (not available at all) and colored pens (like I gave her) are hard to come by. The local fruit and vegetable market. There are no stores for this. 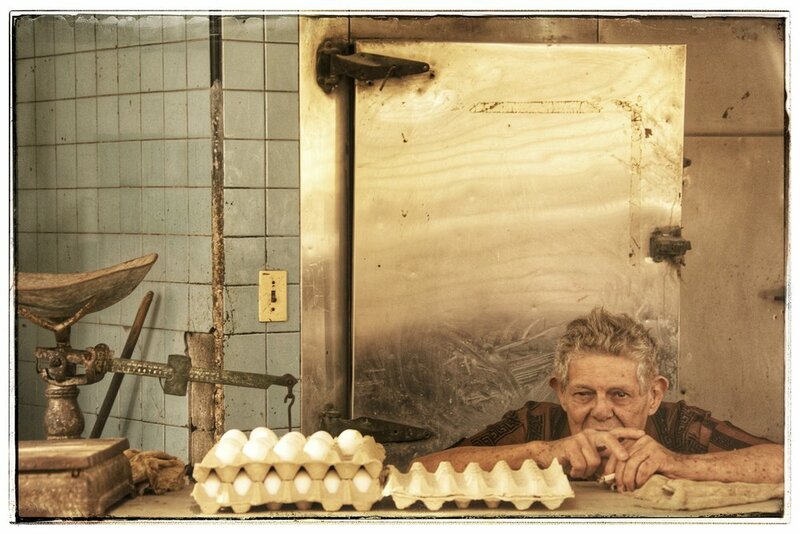 The egg vendor. Many people in Cuba smoke cigarettes. It was said that Cubans are co-dependent and Americans have entitlement issues. 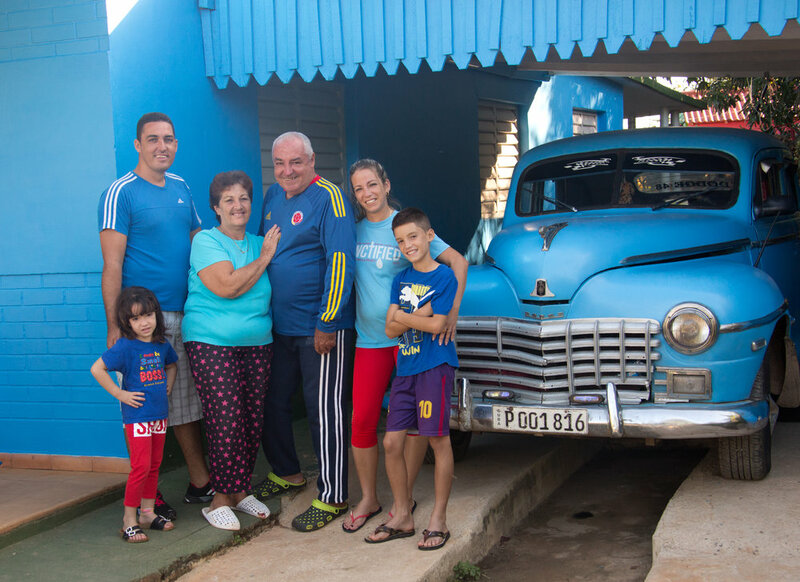 The Cubans may have little, but for the most part are happy and content, not depressed about their lot. Materialism isn’t a part of their life. That is a lesson that would benefit us all. The next (and last) post of Cuba will be on January 6th with not much text but with lots of images showing the Castle and other unique photographs in Old Havana. Hope you enjoy these! Some favorite photographs of Havana.